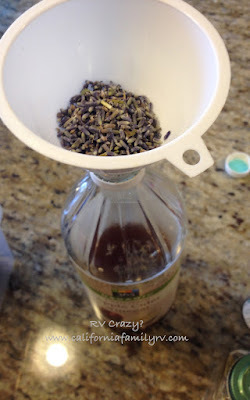 Last year I blogged about making homemade bug repellent for the first time. I was interested in finding a more natural way to keep mosquitoes at bay while we were camping. There's nothing more annoying than itching and scratching all night, after a fun day of hiking or an evening of marshmallow roasting. But I hate those deet-filled, overly scented, sticky concoctions that you buy in stores. And we have tried the more natural commercial blends (which were still overly scented for my taste) but they didn't work well enough. So, I used my best friend, Google to find some answers. Wellness Mama was an awesome inspiration and resource. She's got some great things on that blog of hers. The first blends I tried smelled delicious... Lavender and vanilla, Lemongrass and peppermint, and Rosemary Cinnamon. Mmmm...yum! Fill a 4 oz. spray bottle half-way with distilled water. 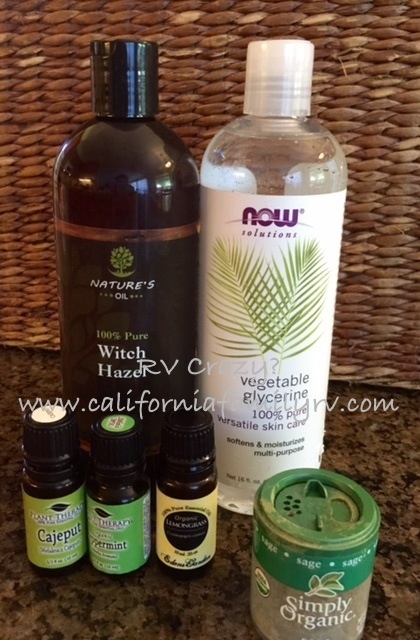 Add 30 drops of essential oils (for each scent you use). 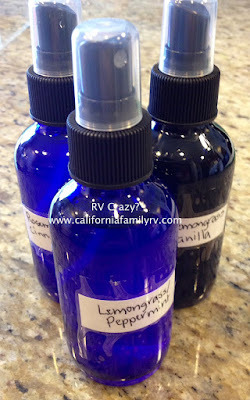 So if you make lemongrass & peppermint, there will be 60 total drops. The possibility for scents are endless with this. My kids loved experimenting with this. This is a great way to get kids involved and invested in wearing the repellents they have created. The verdict: These oil based sprays were light and nicely scented. They didn't feel heavy or oppressive at all. It was almost like wearing a really light body spray. However, we were nervous to use the vanilla scented sprays in bear country, so we avoided that scent in Yellowstone. The lemongrass peppermint one worked the best for mosquitoes, and that is the one we consistently went back to. I loved this scent and the way it worked on me. This was the kids' favorite too. However, at Yellowstone, during prime bug hours, my husband still was bitten when using these sprays. He turned to the heavier-hitting "Four Thieves Concoction" we had made. The kids started jokingly calling it our, "salad dressing" bug spray, but honestly that's what it smells like when you first spray it. The vinegar smell does fade as it dries, but I'm not gonna lie to you, it does smell like strong Italian Vinaigrette when you spray it on yourself. But since this spray was bullet-proof for us, we all thought it was very well-worth it. And I'd much prefer to smell vinegar than those horrible fake-campy scents of the deet sprays. I just can't stand all of that strong fragrance. Since I always have Apple Cider Vinegar on hand, I thought the easiest way to make this recipe was to add the herbs to the nearly-full jar in my pantry. If you prefer, you could add all ingredients to a mason jar. I've made it this way as well and it worked great too. 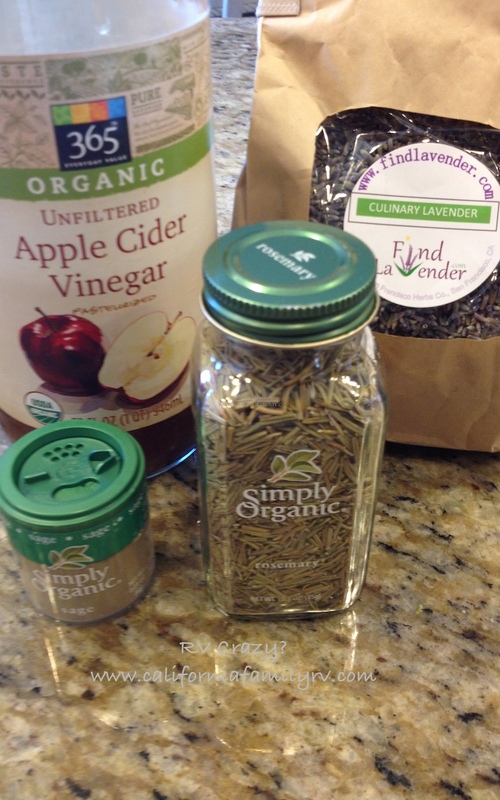 Add all herbs to Apple Cider Vinegar, close lid tightly and shake well. 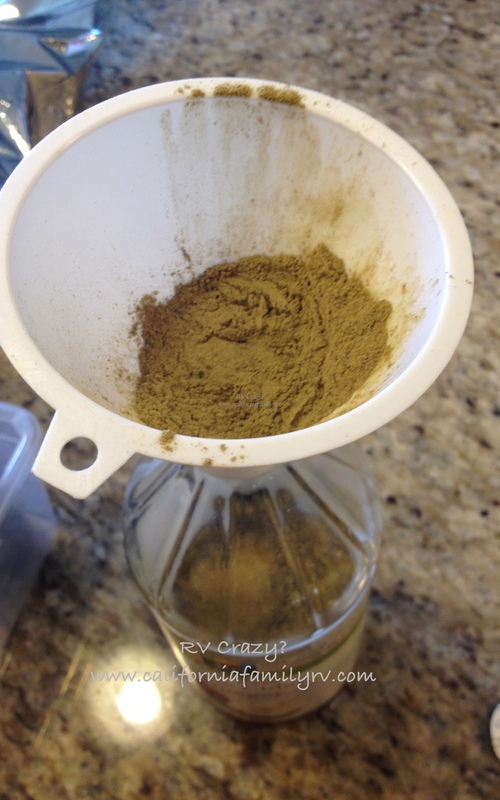 Leave concoction on counter where you will remember it, and shake daily for several weeks. My first batch sat (and was shaken) for about a month. For my second batch, I only remembered to make the repellent 2.5 weeks prior to our trip, and it still worked great! Anyway, keep shaking the repellent every day. Then, prior to using, strain the herbs from the liquid and pour liquid back into bottle. Store in fridge for longer shelf life. Ours was fine, and still very potent, in the cabinet for our 4 day camping trip. Pour 3/4 of the solution into a spray bottle, and fill the rest with distilled water. Your "Salad Dressing Bug Spray" is now ready! You will have to apply more frequently than with commercial sprays, but it worked great for us!